Last week I posted my 2014 gift guide for the tennis reader in your life. Perhaps the most significant of those books, from the standpoint of public life in the U.S. today, was Eric Allen Hall's Arthur Ashe: Tennis and Justice in the Civil Rights Era. 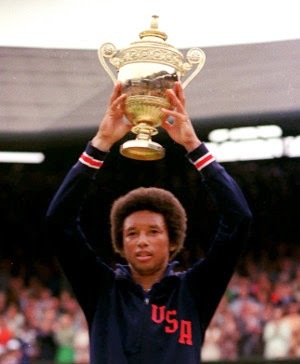 This year black athletes have played a more active role in politics than at any time in the last three decades; with that in mind, Hall's look at tennis's most famous African-American activist becomes a more timely and important read. Here's a Q&A with the author from his office at Georgia Southern University. I’ll start by asking what made you interested in writing this book. You’re a professor of African-American Studies, so you obviously have an interest in the Civil Rights side of the story. But why Ashe? I grew up in a racially and socioeconomically diverse suburb of Chicago where Michael Jordan was king. I played baseball and golf in high school and worked as a public-address announcer and play-by-play radio voice for my college's baseball, softball, basketball, and football teams. I've always loved sports, but it wasn't until graduate school that I began to seriously consider the intersection of race, class, politics, and sports. I chose Ashe because he didn't fit the mold of a "typical" black athlete in the mid-20th century. He wasn't politically apathetic like Althea Gibson or Joe Louis early in his career, but nor was he as militant as Muhammad Ali or Jim Brown. Also, with the exception of a few scholarly pieces by Damion Thomas, Ashe had been overlooked by historians. His civil and human rights legacy was overshadowed by his athletic achievements and untimely death from AIDS. I should also mention that Ashe kept all kinds of written records: letters, newspaper clippings, interview transcripts, handwritten notes, etc. that his family donated to the Schomburg Center for Research in Black Culture in Harlem following his death. These rare materials, coupled with the many memoirs he wrote during his life, allowed me to paint a nuanced portrait of Ashe. What I found was a man whose political philosophy and approach to activism evolved as the Civil Rights Movement gave way to Black Power. Neither militant nor moderate, Ashe faced critics on both sides of the spectrum who accused him of being an Uncle Tom and a racial agitator. What ultimately fascinated me about Ashe was his intellectualism and measured approach to complex issues. He was one of the most intelligent athletes that I have ever come across.